Definition at line 15 of file CLinkMatrix.h. Definition at line 20 of file CLinkMatrix.cpp. Definition at line 28 of file CLinkMatrix.cpp. Definition at line 36 of file CLinkMatrix.cpp. Internal method performing apply and undo of column pivoting. Definition at line 562 of file CLinkMatrix.cpp. References CVectorCore< CType >::array(), CMatrix< CType >::array(), C_INT, dlaswp_(), mRowPivots, mSwapVector, CMatrix< CType >::numCols(), CMatrix< CType >::numRows(), and CVectorCore< CType >::size(). Referenced by doColumnPivot(), and undoColumnPivot(). Definition at line 115 of file CLinkMatrix.h. References mRowPivots, and CVectorCore< CType >::size(). Referenced by CModel::buildRedStoi(), doRowPivot(), and undoRowPivot(). Internal method performing apply and undo of row pivoting. Definition at line 506 of file CLinkMatrix.cpp. 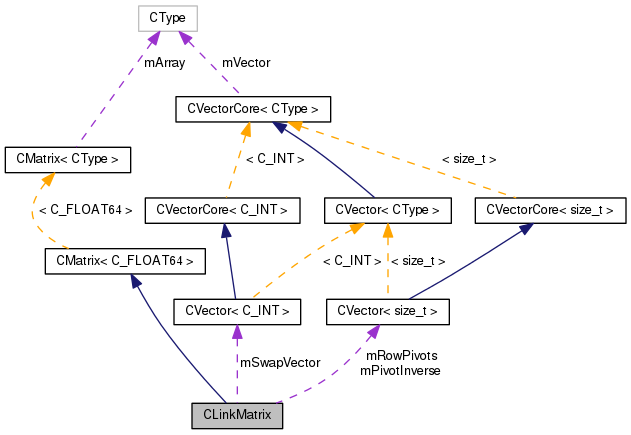 References CMatrix< CType >::array(), C_FLOAT64, CMatrix< C_FLOAT64 >::numCols(), CMatrix< CType >::numCols(), CMatrix< CType >::numRows(), and CVectorCore< CType >::size(). Definition at line 44 of file CLinkMatrix.cpp. References CVectorCore< CType >::array(), CMatrix< C_FLOAT64 >::array(), CMatrix< CType >::array(), C_FLOAT64, C_INT, C_INT32, completePivotInformation(), dgeqp3_(), dlaic1_(), dtrtri_(), fatalError, max, min, mIndependent, mRowPivots, CMatrix< CType >::numCols(), CMatrix< CType >::numRows(), CMatrix< C_FLOAT64 >::resize(), CVector< CType >::resize(), and TAU. Referenced by CModel::buildLinkZero(), and CMCAMethod::createLinkMatrix(). 90 * matrix A: A*P = Q*R using Level 3 BLAS. 96 * The number of rows of the matrix A. M >= 0. 99 * The number of columns of the matrix A. N >= 0. 102 * On entry, the M-by-N matrix A. 110 * The leading dimension of the array A. LDA >= max(1,M). 115 * the J-th column of A is a free column. 117 * the K-th column of A. 120 * The scalar factors of the elementary reflectors. 123 * On exit, if INFO=0, WORK(1) returns the optimal LWORK. 126 * The dimension of the array WORK. LWORK >= 3*N+1. 128 * is the optimal blocksize. 133 * message related to LWORK is issued by XERBLA. 136 * = 0: successful exit. 137 * < 0: if INFO = -i, the i-th argument had an illegal value. 144 * Q = H(1) H(2) . . . H(k), where k = min(m,n). 152 * A(i+1:m,i), and tau in TAU(i). 244 // Calculate Row Echelon form of R.
263 * This is the Level 3 BLAS version of the algorithm. 270 * = 'L': A is lower triangular. 274 * = 'U': A is unit triangular. 277 * The order of the matrix A. n >= 0. 288 * assumed to be 1. 290 * the same storage format. 293 * The leading dimension of the array A. lda >= max(1,n). 299 * matrix is singular and its inverse can not be computed. Definition at line 384 of file CLinkMatrix.cpp. References CVectorCore< CType >::array(), completePivotInformation(), mRowPivots, and CVectorCore< CType >::size(). Definition at line 340 of file CLinkMatrix.cpp. References CVectorCore< CType >::array(), C_INT, mPivotInverse, mRowPivots, mSwapVector, CVector< CType >::resize(), and CVectorCore< CType >::size(). Referenced by build(), and clearPivoting(). 342 // We need to convert the pivot vector into a swap vector. Definition at line 552 of file CLinkMatrix.cpp. Definition at line 496 of file CLinkMatrix.cpp. Definition at line 491 of file CLinkMatrix.cpp. Definition at line 486 of file CLinkMatrix.cpp. Referenced by CModel::buildLinkZero(), CMCAMethod::createLinkMatrix(), and rightMultiply(). Definition at line 39 of file CLinkMatrix.cpp. Definition at line 445 of file CLinkMatrix.cpp. 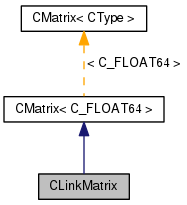 References CMatrix< CType >::array(), CMatrix< C_FLOAT64 >::array(), C_FLOAT64, C_INT, dgemm_(), getNumDependent(), K, mRowPivots, CMatrix< C_FLOAT64 >::numCols(), CMatrix< CType >::numCols(), CMatrix< CType >::numRows(), CMatrix< CType >::resize(), CVectorCore< CType >::size(), and CMatrix< CType >::size(). Right multiply the given matrix M with L, i.e., P = alpha M * L. Note the columns of M must be in the same order as L.
Definition at line 398 of file CLinkMatrix.cpp. References CMatrix< CType >::array(), CMatrix< C_FLOAT64 >::array(), C_FLOAT64, C_INT, dgemm_(), getNumIndependent(), K, mRowPivots, CMatrix< CType >::numCols(), CMatrix< C_FLOAT64 >::numCols(), CMatrix< CType >::numRows(), CMatrix< C_FLOAT64 >::numRows(), CMatrix< CType >::resize(), CVectorCore< CType >::size(), and CMatrix< CType >::size(). Definition at line 557 of file CLinkMatrix.cpp. Definition at line 501 of file CLinkMatrix.cpp. The number of linear independent rows. Definition at line 200 of file CLinkMatrix.h. Referenced by build(), and getNumIndependent(). Definition at line 190 of file CLinkMatrix.h. Referenced by completePivotInformation(), and undoRowPivot(). Definition at line 185 of file CLinkMatrix.h. Referenced by applyColumnPivot(), applyRowPivot(), build(), clearPivoting(), completePivotInformation(), doRowPivot(), getRowPivots(), leftMultiply(), and rightMultiply(). Definition at line 195 of file CLinkMatrix.h. Referenced by applyColumnPivot(), and completePivotInformation().